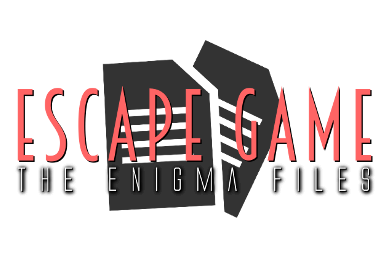 While we were visiting Escape Game Brighton, we picked up a copy of Escape Game Product‘s The Enigma Files, a play-at-home escape-like game. For nineteen pounds we got a fairly large but disappointingly slim reinforced envelope. Having been underwhelmed by the Escape Game Brighton room, I fully expected the takeaway puzzle to be easy to solve, especially when I saw that they recommended only two players, a time limit of an hour and that the clue system was email-based, which suggested that they weren’t expecting people to hit any problems. The two of us opened the envelope and threw the contents on the table. They weren’t the most inspiring in the world but they were at least intriguing and gave us plenty to get going with. So much so, in fact, that we should probably have cleared more space – we ended up having to pile things two or three deep to fit it all in front of us. Before long, though, we had things properly unpacked and were able to start actually looking through it. So we sat. And searched. And read. And thought. And looked at each other in mild bemusement. We had no clue where to start. For a game produced by a company whose room I’d escaped from in around 20 minutes I was shocked at how hard the Enigma Files was. Eventually, though, we started making progress. Puzzles fell and, as often happens with very open games, that narrowed down the clue pile and helped us with the next puzzle. Along the way, we also started to get the outline of a story hidden among the clues. It wasn’t prominent – you certainly didn’t need to understand the story to solve the game – but it hooked me a bit. Sadly, the story never really got explained – Mrs Logic and I had different interpretations which both seemed valid and wildly different. I think that’s a mistake because they could easily have provided a finishing story on their website to wrap up the mystery and give a sense of closure. What of the puzzles? Well, there were a couple of semi-physical puzzles in there (inasmuch as you can have physical puzzles when using laminated print-outs), which made things a little more interesting, but most of them were quite similar. I say most of them but, in truth, there were very few puzzles indeed. Nine if I’m being charitable but really you might say as few as five. As you may have guessed from the opening paragraphs, none of them were easy, but one or two felt downright obscure. If you’re lucky enough to get through the full set, the bonus puzzle (which you’re not even told about until you confirm that you’ve got the right basic answer) is ridiculously hard. We failed to solve the mystery; we solved all but one of the puzzles but we just couldn’t work out the meaning of one particular thing. When we did find out, we both felt it was a leap. Having said that, I have a friend who played and solved it, so it’s not impossible. Definitely not intuitive, though. This game has a long list of flaws: components that are hardly high quality, annoying red herrings, a puzzle that is distinctly dubious, no reveals (because you get all the clues from the start), not enough puzzles, a repeated mechanic for one part of the game, a flawed story, puzzles that don’t really make sense in the theme and no real finale. If you want to dislike it, there is reason in abundance. And yet, in spite of all the flaws, I surprised myself in enjoying big chunks of this game. When I played ThinkFun’s outing, I always felt like there was no real challenge – little to get my teeth into. Here I was left stumped for so long that I felt genuinely excited when we started solving puzzles. Maybe that was akin to Stockholm Syndrome but it still resulted in the highs of this game being a bit higher than those of other play-at-home games. If you want an easily accessible game that’s well made and involves logical puzzles, then don’t look here – try Stargazer’s. On the other hand, if you want something that’s a genuine challenge at times (but a ridiculous one at others!) and will almost certainly have you communicating with your teammates, this may appeal to you. And be prepared to ask for clues! Easy – just throw it all back in the bag.